Reigning USA Sailing Series Champ and Gold Cup defender Steve Howe on Warpath is back, looking to stake his claim on another big win. All hot competition bets are on Andrea Pozzi’s Bombarda, former Audi Sailing Series Champion Lanfranco Cirillo on Fantastica, National Champion Jason Carroll on Argo and 2011 World Champion William Douglass on Goombay Smash. The three day event starting on Friday, will also feature the highly-anticipated Take A Junior Sailing Day, a truly golden opportunity for the who’s who of youth sailing in the USA to ride aboard and race the rocket-powerhouse Melges 32. This worthwhile junior effort is one that Melges 32 owner’s look forward to every year. 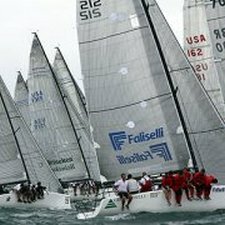 The 2012 Melges 32 Gold Cup Press Team will be bringing live reports and updates of the racing via the Melges 32 Blog. Every start, play and finish will be published. In addition, the latest racing developments will post to the Official Melges 32 Facebook Page. A host of photos from the event can be found online at melges32.com.